If you're serious about winning your fantasy league, then you know all about the waiver wire. If you're active on the wire, that gives you a much better chance at winning your league. If you aren't, you probably have no idea what you're missing. In 2015, picking up DeAngelo Williams after Le'Veon Bell went down won you multiple weeks. David Johnson appeared just in time to bring home fantasy championships. Last year, guys like Jordan Howard were most likely available. We've seen it already this year! If you're in more of a casual league, Kareem Hunt could have been available. And we can't forget defenses. It is never a bad move to transition weekly from defense to defense playing the matchup. With all the week 1 injuries that have occurred, the wire is full of guys who can be plugged into your starting lineup. Note: all of these players will be owned in UNDER 40% of Yahoo! leagues. Sam Bradford (25% owned): How about Sammy B last night? Bradford torched the New Orleans Saints for 346 yards and 3 touchdowns. In the words of Rotoworld.com, "He couldn't have played any better." 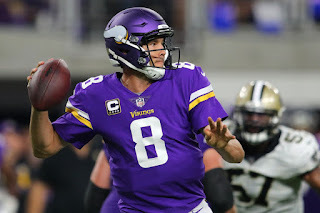 Although it was an easy matchup, anybody who actually watched the game realized that Bradford looked really good last night. He and Stefon Diggs appear to have a real connection going. In the upcoming weeks, he has some pretty good matchups. In his next 8 games, he faces Tampa Bay, Detroit, Chicago, Green Bay, Cleveland, and Washington. If your quarterback has a couple tough matchups in the near future, I recommend stashing Bradford. Tarik Cohen (15% owned): In the words of @360FFB on Twitter, "Tarik Cohen and Jordan Howard are much like Devonta Freeman and Tevin Coleman." Would that be a great thing or what? Cohen was only out touched by a total of 3 by Jordan Howard and did much more impressive work than Howard. He seems to be at least the pass-catching back in the Windy City, and that bodes well for Cohen. He had numerous highlight plays including a field-reversing play that almost went for 50 yards. Cohen could obtain FLEX value in PPR leagues in a hurry. There's always room for an electric playmaker in any offense, and that is what Cohen appears to be. Cooper Kupp (29% owned): Although Sammy Watkins might be the most talented receiver on the Rams, Cooper Kupp might be the guy with the best chemistry with Jared Goff. Kupp caught 4 passes for 76 yards and a touchdown Sunday in the blowout 46-9 win over Indianapolis. He looked great and solidified his role in the Los Angeles offense. With games against Washington, San Francisco, and Dallas in the next 3 weeks, you could be looking at a nice little weapon in Cooper Kupp. Kenny Golladay (21% owned): We heard about Kenny Golladay early in the offseason. We heard about Kenny Golladay in training camp. We heard about Kenny Golladay in preseason. And what did Kenny Golladay do in week 1 of the NFL season? He produced! He caught two touchdowns in a big win over Arizona. At this point, it's going to be hard to keep Kenny away from the football. Alvin Kamara (14% owned): Alvin Kamara did not produce very well last night, but he still had a positive night for Kamara owners. He led the New Orleans Saints in snaps, carries, and rushing yards. This number might look misleading because the Saints got blown out, but it was actually Mark Ingram doing most of the garbage time work. Kamara didn't get much going against the tough Minnesota defensive line, but neither did Peterson or Ingram. Kamara is a great PPR stash in the high-octane Saints offense. Oakland DST (36% owned): Oakland plays the New York Jets next week, which automatically makes them a solid play. They aren't a good defense otherwise, but neither are the Bills and they still did well last Sunday. Oakland had a decent showing against Tennessee, and they also have a very good return man in Jalen Richard. The Raiders are my #1 plug and play defense of the week.